U.S. cattle futures rose Friday as traders squared positions ahead of a key U.S. Department of Agriculture cattle-on-feed report. Cattle for August delivery rose 0.2 cent, or 0.2%, to $1.143 a pound in trading at the Chicago Mercantile Exchange. CME October cattle rose 0.1 cent, or 0.1%, to $1.155 a pound. Feeder cattle for August rose 0.4% to $1.333 a pound. Trading was relatively modest ahead of the USDA report, due out after Friday’s market close. Analysts surveyed by Dow Jones Newswires expect the report to show cattle producers added 16.9% more cattle to feedlots in July as compared to next year. A surge in placements would signal a boost in cattle supplies for the rest of 2011 and then a tightening of supplies in 2012 as producers have fewer animals to sell. The cash cattle markets were quiet Friday following Thursday’s moderate trading activity. Sales in Texas and Kansas occurred at $1.13 to $1.14 a pound live basis, down 2 to 3 cents a pound from last week’s trading. About 14,000 head were sold on a negotiated basis this week in Texas and 30,000 in Kansas. In Nebraska, sales of around 30,000 head were reported for Thursday at $1.81 to $1.825, mostly $1.82 a pound on a dressed basis, down from $1.85 a week ago. Live sales there were from $1.12 to $1.145 a pound, compared with mostly $1.17 the previous week. USDA’s midday boxed beef price quote for choice grade carcasses was up 26 cents to $186.86 a hundred pounds. Select beef prices rose 70 cents to $183.84 a hundred pounds. Sales were reported at 114 total loads. The latest HedgersEdge packer margin index was plus $51.55 a head, compared with $45.85 the previous day. The weekly average was $37.37. This is an estimate of packer returns on cattle slaughtered and processed expressed in the form of an index. Lean hog futures also rose Friday as traders shifted positions after days of sharp losses. 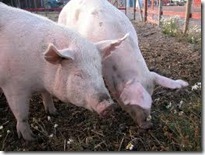 August hog futures rose 1.55 cents, or 1.8%, to 88.37 cents a pound in trading at the Chicago Mercantile Exchange. CME October hog futures rose 1.75 cents, or 2.1%, to 84.87 cents a pound. Friday’s rally in the hog complex reversed portions of the steep fall in prices that futures have been riding since early August. The industry is bracing for a sharp seasonal rise in hog supplies after a summer of tighter supplies witnessed all-time record prices for hogs and futures. Hog producers typically grow their production starting leading into fall, when consumers eat more meat and cooler weather makes for more efficient hog-raising. Slaughter rates are expected to grow 15% between this week and October. Cash hog prices were reported steady to as much as $1 per hundredweight lower. Buyers were bidding mainly for deliveries during the second half of next week. This week’s slaughter was estimated at 2.046 million head, down 1.3% from year ago. Some livestock dealers and analysts predict slaughter next week to reach or exceed 2.1 million head. The terminal markets traded steady to $1 per hundredweight lower on a live basis with top prices from $67 to $71 per hundredweight on a live basis.